NEW Advanced Technology Vibration Isolation - Four elastomeric handle isolators absorb and isolate vibration transmitted through the transmission case. Less Vibration - Handle support spring supports the weight of the handle assembly while isolating vibration from the transmission case. Power for the Long Haul - Available with a Honda GX160 or a Briggs & Stratton Vanguard 6.5-hp; Built to last cast-iron gear case. Optional Tote Trailer for On-Road Trailer Use - Transports Jr. Sod Cutter, Lawnaire IV and V Plus aerators. Choice of Sod Widths - Available in either 12 or 18 cutting widths. 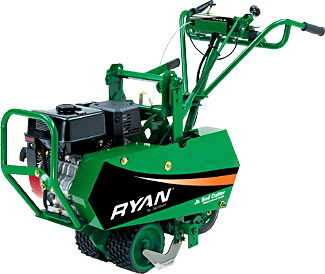 Please call us for any questions on our sod cutter 18 inch in Clearwater FL, Tampa, St. Petersburg, and West Pasco County, Pinellas County, and Hillsborough County.